There were no surprises in the February Construction Spending report from the Bureau of Census, with a marked decline in private residential construction spending. 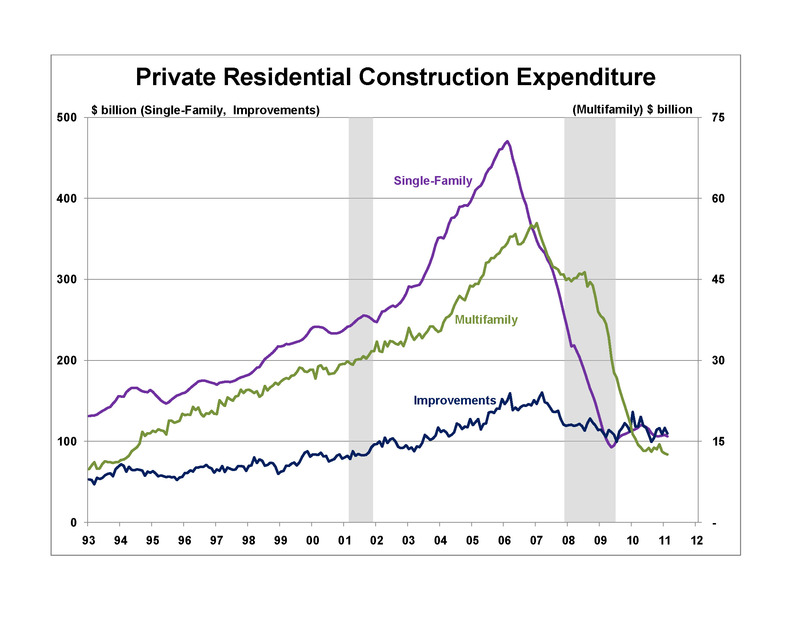 Private residential construction spending fell 3.8% to $228.5 billion, following an unexpected increased in January. Spending was down in all sectors of private residential construction in February. Home improvement expenditures led the decline, down 5.6% to $109.8 billion—giving back most of the gain in January. Single-family construction spending was $1.7% lower at $106.1 billion and multifamily construction spending was down 1.5% at $12.6 billion. Poor weather was partially to blame for the weak private residential construction expenditures, with heavy snowfall across much of the United States during February. But overall, the numbers reflect the depressed state of the housing sector, with single-family housing starts falling back sharply to a level only marginally above their record low of April 2009 and the highly volatile multifamily housing starts down almost 50% following an irregular bounce in January. With home improvement spending closely related to home sales, the decline echoes the very weak housing demand, with new home sales falling to a new record low in February and existing home sales down over 10%. Overall, total private construction spending was down 1.4% to $469.0 billion. The decrease in private residential construction spending offset in part by a 0.9% increase in private non-residential construction spending, with a rise in manufacturing (+5.6%), power (+2.8%), transport (+2.0%) and communication (+1.5%) expenditures. Government expenditures were down 1.4% in February, with notable declines in spending on water supply (-6.1%), education (-3.7%) and office buildings (-3.3%) as the spending on infrastructure through the economic stimulus package (American Recovery and Reinvestment Act) nears its end. In sum, total construction spending was down 1.4% to $760.6 billion in February, its lowest level since October of 1999.